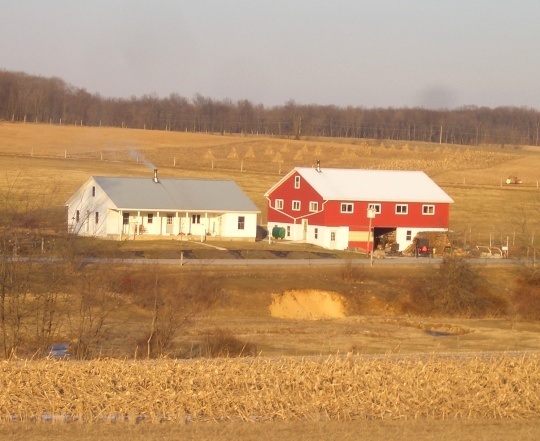 Continuing the “10 views” series, today we have photos of Juniata County, Pennsylvania. 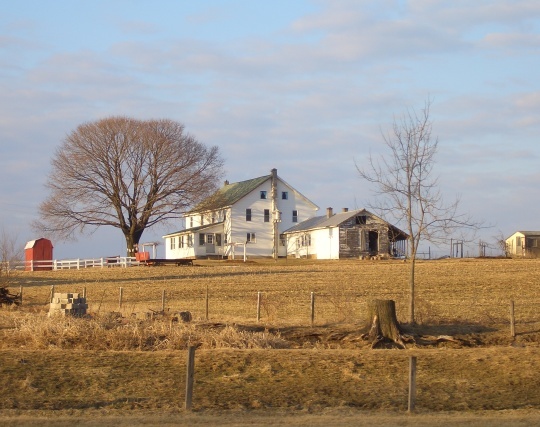 A couple months ago we had a post on the Juniata County Amish. 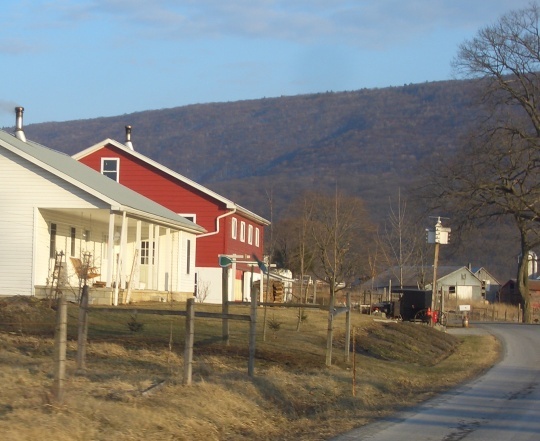 This community is one of the many lesser-known Pennsylvania settlements. With 8 church districts, it’s actually a pretty sizeable one. That’s about 1000 Amish, give or take. 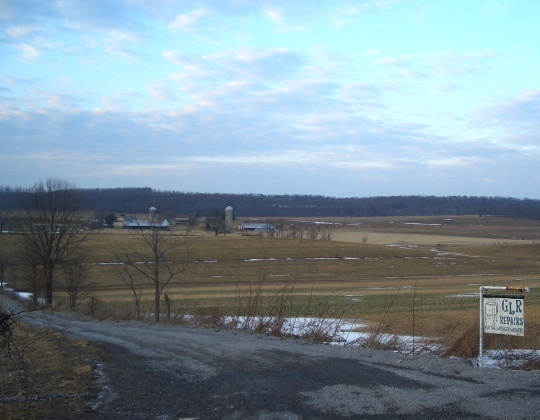 But Juniata County is overshadowed by nearby Big Valley, nearly 4 times its size, and of course, Lancaster County. Follow the link above to read more on the community. 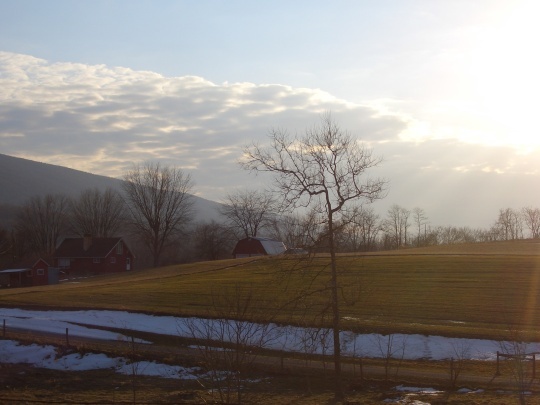 I found Juniata County a beautiful place even in chilly February; what do you think? Very nice images Erik, i really like the 1st one as those tend to be some of my favorites. from these few pictures, this Amish area reminds me alittle of Lebanon because its unspoiled by any real tourist activity or anything tacky.Im sure you will be getting alot of comments on this post, nice job. Richard from Penn. Ditto Richard! I’d love that first picture as my screensaver. Those pictures are wonderful – great job! Thanks Richard! I think you may be right. Juniata County is definitely off the beaten path, maybe even more so than Lebanon. Lebanon is kind of like a satellite of Lancaster (for instance it is buggying distance for some Amish who visit Lancaster relatives–though it’s a long ride) but still it is nothing like Lancaster in terms of development. Beth if you want the original larger version I’d be happy to send it to you. 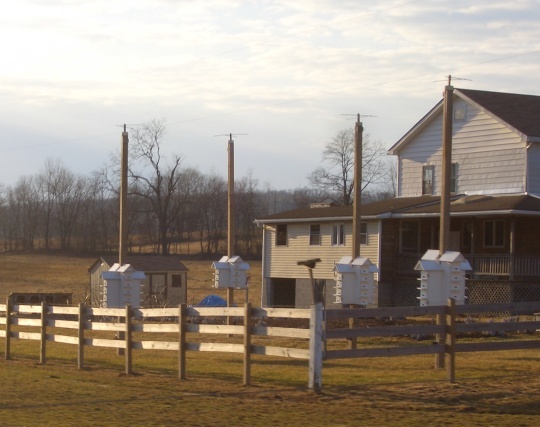 Thank you for sharing Erik….I love seeing pictures of the Amish…..where is Juniata Country to Lancaster Country?? I have been to Lancaster a few times but have never heard of Juniata Country. Thanks so much. Sure thing lanore–it is about 1.5-2 hours away from Lancaster in central PA. 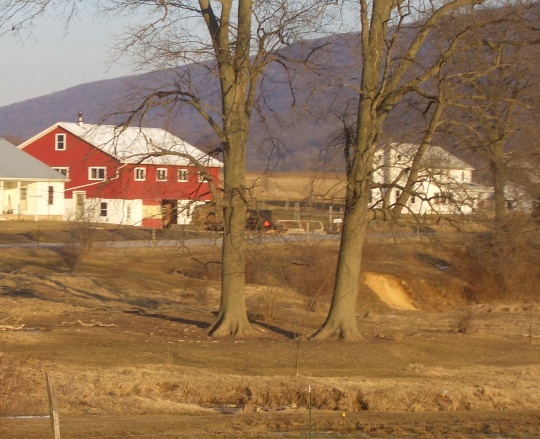 If you follow the “Juniata County Amish” link at the top of the post, you’ll see a map. I thought id post this before i left the house, its unrelated to Erik’s post, so ill make it short. It looks like there will be another documentary on British TV regarding the Amish. The brits seem fascinated with the Amish the last few years especially, so this time around a group of British children will live with the Amish in the USA. I just saw this online before i was ready to go, and i thought id post it before i forgot. I’m sure they will be contacting you Erik at some point to promote this, as far as I’m concerned I’m pretty much done with all these Amish reality shows. Its gone from being mildly interesting to becoming more of a exercise in exploitation . And yes apparently some Amish are going along with the producers in this one, I wont be posting this one anywhere anytime soon. just my 2 cents. Now I’m off. Richard from Pa.
Is the second phot a school house? And I like the white hosue with the long porch/loggia/verandah. My landlady says that as soon as we get all the structural corrections done on this old house, they will add a porch or deck. And – in my news – I am buying, at long last, two milk goats! So we will be moving back into our small scale farming/crofting experiment, God willing! Erik, did you notice that you got a mention of your book over at the Amish Cook? Seems I got one too! It is such beautiful country farmland, so picturesque. I think your photos captured the serene, simple community they live in. I was in Lancaster last weekend. You are right, it seems like it is so different . Although around and about the area there are some beauiful sights to see–the farms, the countryside. 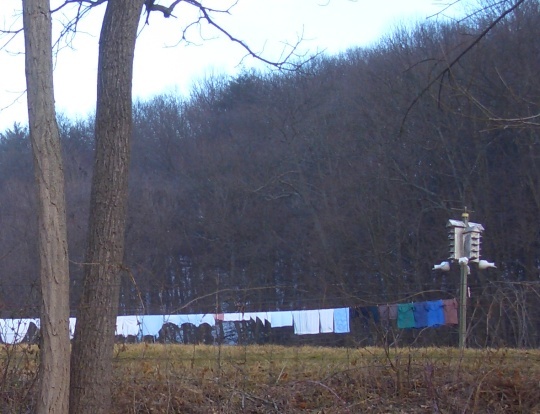 I have to share this with you….I visited my Amish friend when I was there. My friends (English) and I had a tea party with my Amish friend and her daughters. It was such an amazing experience. A rare opportunity and one that I will always treasure in my heart. Erik, I have to say, I love you photos. Thank you so much for sharing them with all of us. Richard, I did see that on the new documentary. I’m not surprised. 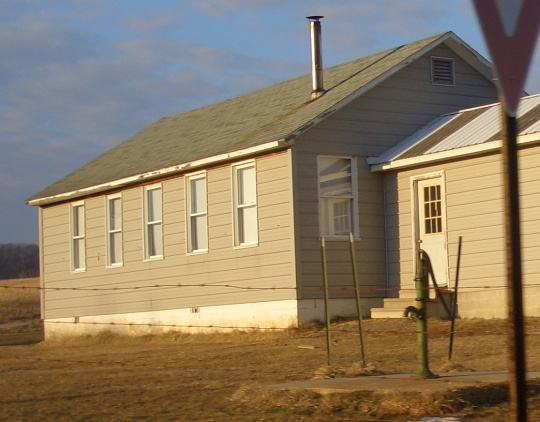 Magadalena, that is a school house with a nice water fountain out front! I did not see that about the book but I will check, thanks for letting me know. Hey Erik…. Sorry about maybe getting a little off topic before on my last comment post. And you did see some info on that up coming amish documentary. I would never try to stop anyone from seeing it, I’m not into censorship in that way. I’m just talking about myself, and how i feel about it. Will these type of shows end anytime soon, id say the answer to that would be a big “no”. Do i have to watch it that would be another “no”, I’m done with them. Now on to the topic,lol, I have to say I’ve grown to really love and enjoy taking pictures. And now i can add amateur photographer as one of my hobby’s. I’m learning that for me to take the best images, i have to get out of the car and just walk. I’ve walked almost a mile to get what i want, and a bonus for me is I’ve bumped into a few folks along the way which only made what i was trying to do that much better. I just wanted to share that because some of your pictures on this post kind of remind me of mine, and which type of pictures that i look for when i take mine. Do you take all your pictures Erik, i think you said you had a pro do them if I’m correct?. Have you ever thought about putting together a calendar at all, i bet you would do pretty well. Richard from Lebanon counties Amish community. Appreciate that on the photos, actually I do take all of my pictures. The only ones that aren’t mine are those that I cite with credit in or at the bottom of the post. I really enjoy taking photos as well, but again it is more a shoot-as-much-as-possible approach and hope some turn out okay 😉 A calendar is a good idea. There are some actual pros out there that are at a higher level. Bill Coleman, Randall Persing, and Doyle Yoder all have very good Amish photos. Some nice photos. 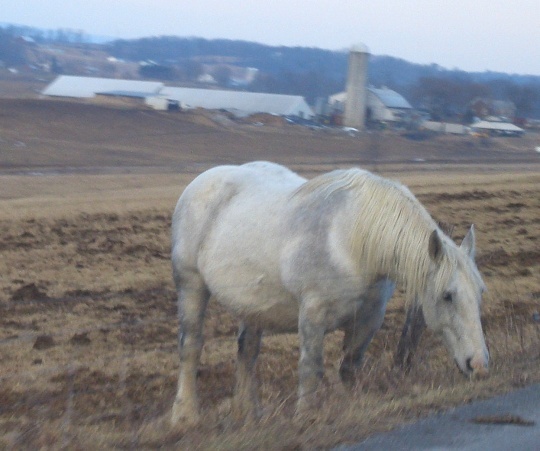 I cant believe a Amish horse was okay with taking such a picture (I know, poor attempt at humor). Richard talk away, I always enjoy it. You have some good insights. As for going back and forth between Lebanon, a friend of mine’s sister who lives in Lebanon comes down to Leola area, it is, I want to say 2+ hours to make the journey, though I hope I’m not off there. telling me to talk away Eric could prove dangerous,lol. And that some long trip by buggy 2 hrs or so, I’m sure the Amish are not crazy about spending that much time on public roads. But I’m sure they are doing what they have to do in visiting and connecting with family and friends. It should be a little more quite now as I’m retiring for the evening from the computer,lol. So good night everyone, and before i forget incase someone out there loves the movie “Witness”. If you don’t have it on DVD or video tape, the Reelze channel will be showing the movie at 8pm. I’m not sure if everyone gets that channel, but i thought id pass it along. as you can see, there’s a reason why Erik keeps me around,lol. Good night. Richard from Lebanon county’s Amish community. Ok, Erik, a calendar would be nice, but I’ve long thought that when you come out with a book with these pictures (hint), I’ll be the first to buy it. It always seems such a shame to leave these beautiful pictures in the computer, not to be seen again. Uh, Erik; I think your “him” is a “her” and a really nice one at that! She is a very close copy of my first Percheron mare, Jackie. Unfortunately Jackie, her one month old colt and another mare were all hit by lightning out in the pasture beside our house. Lost all three. Sure appreciate the shot though, because it brings back fond memories of that sweet mare. Q: Did you photoshop out the fence for posting on your blog? I can see that she is leaning into something, and I can see a hint of a real thin wire or two right at the top of her chest just above the point of her shoulder. You can faintly make it out as it runs along her shoulder and rib cage. However, as the fence leaves her on either side it basically disappears. Did you edit it out, or is the wire just so fine that you can’t see it aginst the darker background of the soil? Nice photos either way. Thanks for posting them. This looks a lot like some of the places here in Mio, Michigan(amish)!!!! OldKat, I can see the wire too, I don’t think it was doctored out. I looked carefully, and there is wire running up and down supporting the horizontal wire, wood or metal posts are probably just out of picture. Lovely horse though. The fourth picture with the red building looks like it is it’s own little Amish village, they just have a number of buildings. ShOm, I think there is a wooden post just off her left shoulder. It kind of morphs into her throatlatch / jaw line. As I move my eyes right to left and up and down in front of my monitor I can make the wire completely disappear and then re-appear. Probably just an optical illusion that makes it hard to see. Must be a very fine electric wire though and obviously the charger is off, because her throat is touching the top wire. She is a super stout mamma. From the looks of that belly she may have a little one coming a little later this spring, but not real soon because she doesn’t have an udder yet. I bet she weighs 1,750 to 1,800 pounds or more. Contrast that to most saddle horses at 1,000 to 1,200 pounds and you can get a grasp of her size. Really nice Perch mare. Wish I had 4 or 5 just like her. Hi Oldkat, no photoshop on the fence(wouldn’t know where to start!) But as you point out you can see the wires if you look really closely. It was near dusk so some of it may just blend with the soil background. And, I am glad you caught my error on the horse gender, but for me pretty much all animals are a “he”–even if you told me it was a “she”, I’d probably still reflexively call it a “he” (with apologies to Mrs. Percheron 😉 ). Just a habit of thinking about all animals as males I guess (I don’t know if you can read anything into that…). But now that you mention it, I do notice a growing belly! Shom in that area there were a lot of buildings clustered together. There is also a buggy shop nearby, and a school. So it was somewhat village-esque. Loretta, on the photo book, it’s a nice idea. Maybe I need to think about it. The problem with photo books is that with all the color images and typical large format they can be pretty spendy to produce. It would probably be fun to do, but in the end you might be my only customer! Instead of a photo book what about putting them on a a disc? Christine, now there is an idea, we shall see. I am definitely glad to hear all these suggestions so thanks for sharing.